Three new works unveiled on 6/9/2018! Robert will be in the gallery on Saturday working on his newest painting. The nature of a smooth cup of coffee, a warm embrace, a great reading adventure, the decadent taste of rich chocolate in our mouth (or potato chips, but that's just me! ), our coveted favorite music and even the nature of being tired after knowing we put our best into what was a hard day can be a sweet surrender, can make us feel good. The essence of art, whether detailed or abstractly, delivers an equilibrium we search for, regardless if we are aware of that or not. THE NATURE OF Exhibition will have artists doing live work in the gallery on Saturday, June 9th. Distinguished Cherokee Treasure, Jane Osti from Tahlequah will be demonstrating her carving techniques on pottery. Osti is well respected and collected for her traditional and contemporary clay sculptures. 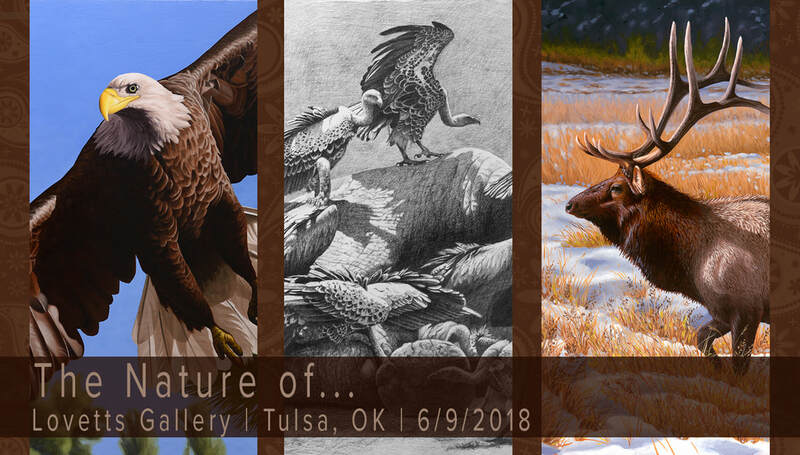 Oil and acrylic artist James Johnson will be painting from his observations about art and life from his unique perspective. He is beloved here and internationally and always a treasure to collectors.